Many serious problems and equipment failures can be prevented with annual maintenance of your air conditioning and furnace systems. 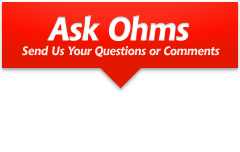 At Ohms Mechanical Services, we work hard to ensure the safety, comfort and satisfaction of all our customers. Every Ohms certified installer and service technician must meet our highest standards in order to provide the safest and most efficient services to our customers. Our technical staff must successfully complete extensive training and we are all always kept up-to-date with today's continually changing technologies. At Ohms Mechanical Services, we have aligned ourselves with some of the best manufacturers in North America to bring you all the major carriers you have come to know and trust. Meet your indoor comfort requirements with quality heating and cooling services from Ohms Mechanical Services. Make your home or office warm or cool depending on your preferred temperature with our furnaces, boilers and air conditioning units from leading manufacturers. If your system is malfunctioning, we have HVAC specialists who can respond to your urgent repair needs. Stay comfortable throughout the year with the help of Ohms Mechanical Service. Call us today at 905-294-2089 to request a free quote for a new HVAC system. We strive to keep you cozy from spring to winter with energy-efficient heating and air conditioning solutions. Our technicians are certified and highly trained to provide the right fix the first time you encounter problems with your HVAC equipment. Call us now at 905-294-2089 for emergency repairs. Ohms Mechanical Service is available 24 hours a day to immediately attend to your heating and cooling concerns.